Improved since its development in 1979, the maglite is one of the worst most popular and best flash lights of today, with a focusable beam and corrosion and shock resistant aluminium construction. 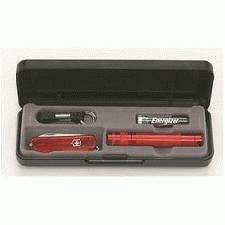 Our Custom Maglites in Presentation Boxes have many different features including a lanyard, a 7 blade swiss army knife, spare bulb and AA battery - all packaged individually for your customer's enjoyment. Engraved with your company's brand name and logo, you can be sure to shed some light on your brand name after all, and gain public exposure as well as future business opportunities. Customise your business gift with a choice of colours available: blue, red or black! For a FREE QUOTE, please fill in the form regarding our Custom Maglites in Presentation Boxes and we'll be able to help you.